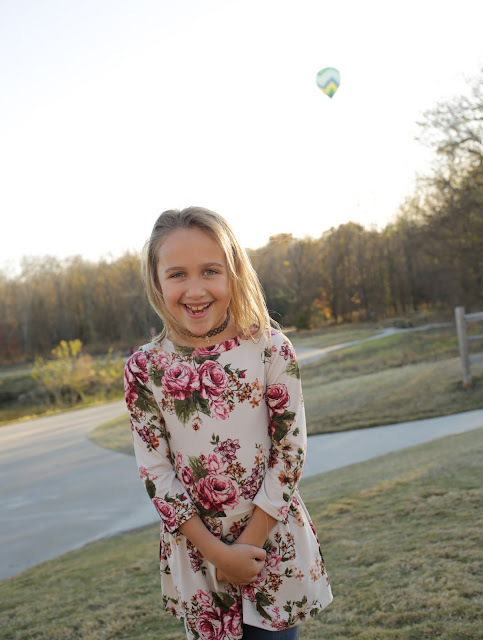 My second oldest daughter, Tabitha, just turned 7 last month. She has always been into dresses, purses, hairbows, and all things girly. Thank God we live in a milder climate because she refused to wear any type of pants for so long. It was a constant battle when we did have our colder days. 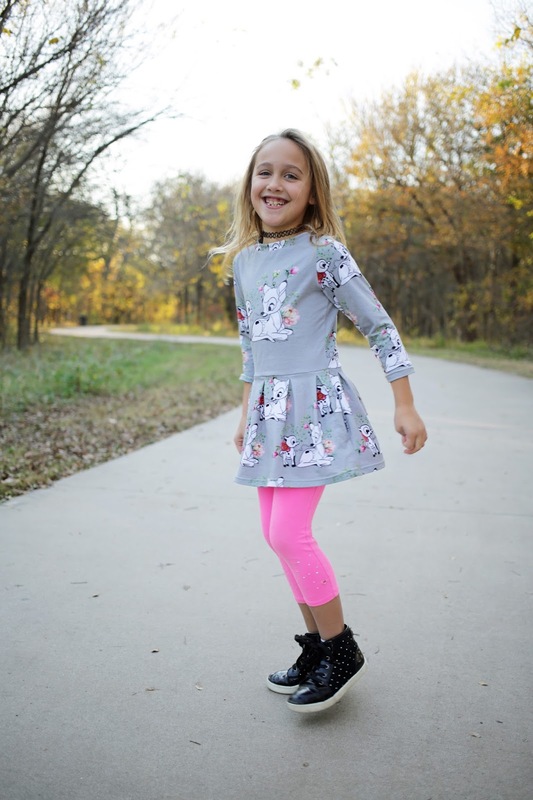 She thought that even leggings did not go with her beautiful dresses! Well, about 6 months ago, she started riding her bike without training wheels. 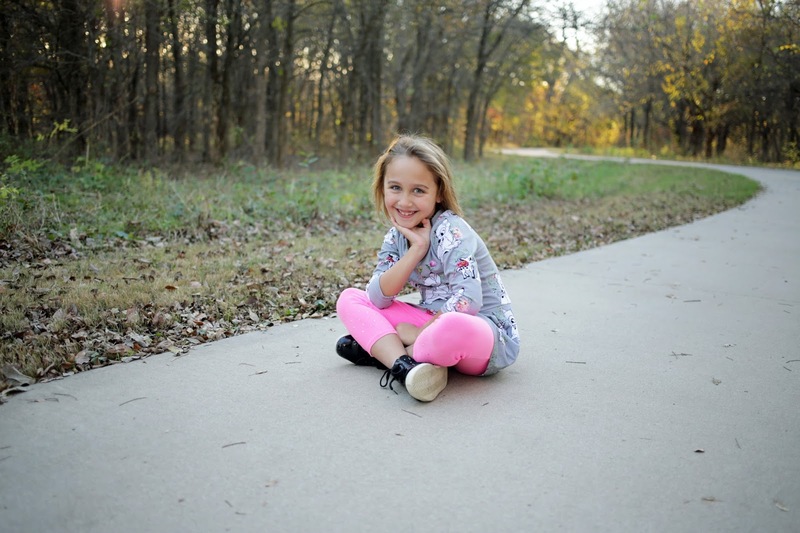 She has since been riding her bike every day, and she quickly learned how nice it is to wear jeans or leggings. 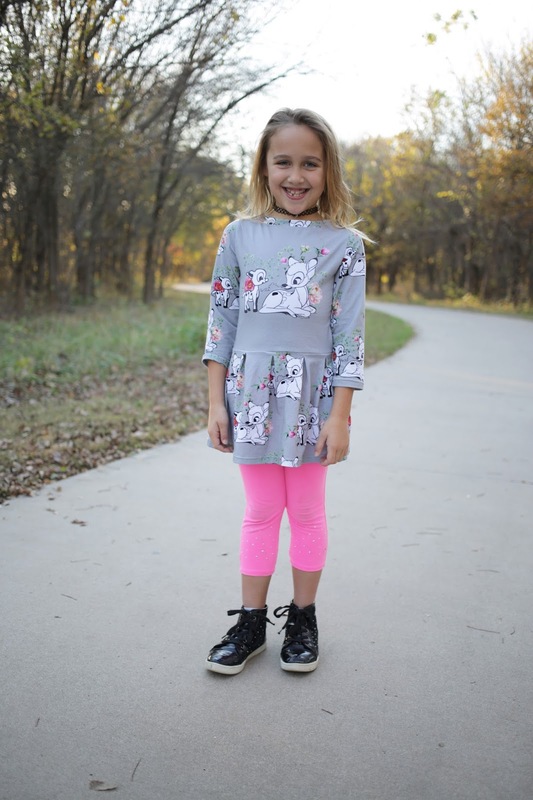 It took one fall in a dress, and she was sold on the idea of wearing pants! I was so excited when I was chosen to test the newest pattern by Sofilantjes, the Regina Dress and Tunic. I made the tunic version with a pleated skirt and 3/4 length sleeves. 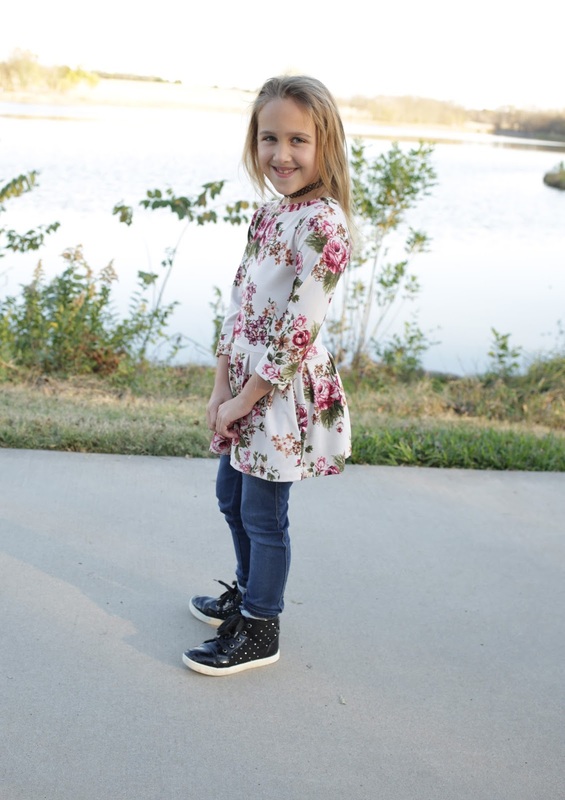 The sleeve length is perfect for our mild winters, and the adorable tunic length gives my dress loving girl a top that works perfect for wearing pants but has the dressy feel that she loves. "Pockets!!" She squealed with delight when she found out the tunic had pockets. I made her a size 7 and graded in the chest area for her more lean frame. The pattern came together very easy and had superb instructions. The bodice is the same for the front and back, and the sleeves are cut on the fold. This tunic is made out of double brushed polyester from Syncerely Rylee. It is such a soft print and has a great weight to it. 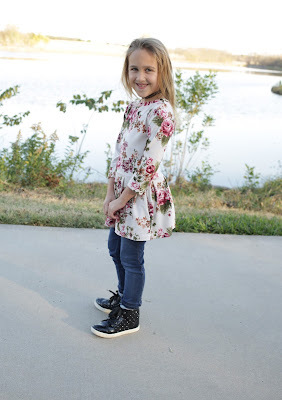 The next Regina Tunic that I made for Tabitha was in a cotton lycra that came from my friend Aimee's stash. Isn't she an awesome friend!?! I just adore this fabric! I was able to get each tunic out of less than a yard of fabric. Tabitha has been wearing both tunics as soon as they come out of the laundry and begging me to wash them again! 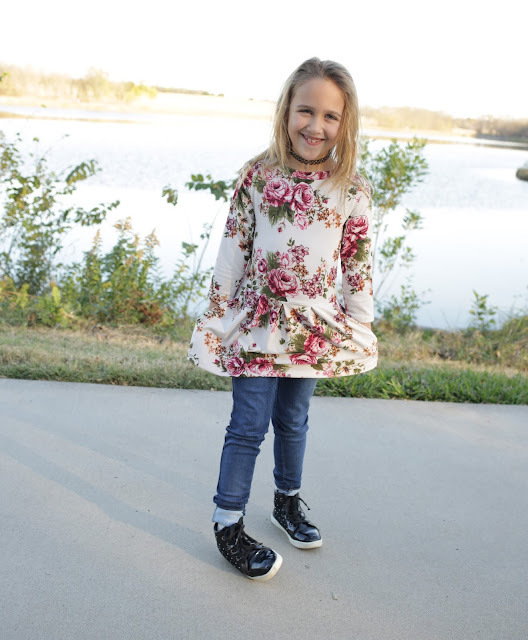 The pattern comes in sizes 12 months to 14 years so I can see myself making many tunics and dresses for all my girls in the coming years. 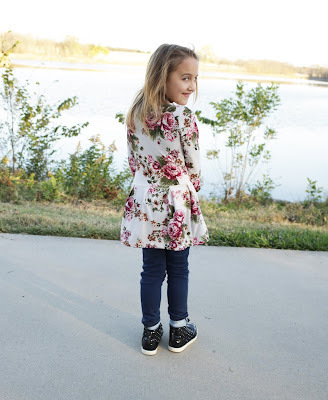 Thanks Anne Jacobs for all your hard work on this pattern! You can grab a copy of the Regina pattern in English here. It is on sale now through Monday, December 4th, at 4:55 p.m. CST (23:55 CET). The pattern is also available in French and Dutch.